Avenir Software Inc. - News - Viega LoopCAD Update Released! Leaders, or any portions of a circuit, can be moved to be below the floor and not included as part of the heating panel. A new update for the Viega Edition of LoopCAD 2018 has been released. The software now provides the capability to draw the distribution (supply/return) piping for Snow Melt projects. 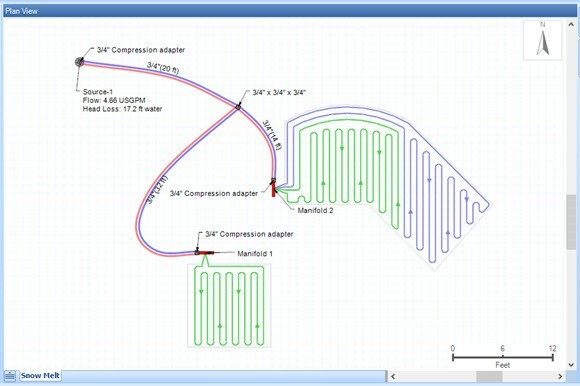 A new update for the Viega Edition of LoopCAD 2018 has been released and it now provides the capability to draw the distribution (supply/return) piping for Snow Melt projects. If you currently use the Viega Edition you can get this update now by using LoopCAD's built-in "Check for Updates" feature located on the Main Menu, or by going directly to www.LoopCAD.com/Viega. Draw straight runs or curved piping paths. This update to LoopCAD 2018 is FREE for all Viega Edition users with an active subscription. Make sure to scroll down the page to select Viega Edition to get the new Supply/Return Piping feature. If you already have LoopCAD 2018 installed and activated, just download and install this new update and you are done - no further activation will be needed.